Hammertoes, perhaps better described as “curled” or “bent” toes, are a widespread cause of foot discomfort and a common source of insecurity about foot appearance. A hammertoe gets its name from the way it looks from the side – with a fixed bend in one or both of the toe’s joints, it creates a shape that looks like the head of a hammer. Fortunately, many cases of hammertoes can be improved, if not completely reversed, through nonsurgical measures. Here’s an overview of what causes hammertoe and how the condition can be treated without surgery. Hammertoe typically affects the second, third or fourth toes and is caused by repeated constriction, often when the toes are forced into a bent position for long periods of time. This constriction results in a muscle imbalance, causing the toe to assume a curled or bent position. Though you may not realize it, there are six sets of muscles that help to stabilize the bones of your second through fifth toes. Each of these muscles works to keep the toes flat on the ground when you’re walking. 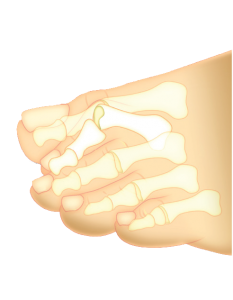 When the muscle balance is thrown off, it can lead to bucking and contracting of the toe joint. A majority of hammertoe cases result from wearing uncomfortable shoes, particularly shoes that are narrow, tight or pointy toed – all of which can bind the forefoot. Other risk factors include foot anatomy and prior toe injuries. For instance, if you have a bunion or a second toe that’s longer than your big toe, you are more likely to develop this condition. How do you reverse hammertoe? In many cases, hammertoe can be successfully treated without surgery if it’s tended to in its early stages while the affected toe is still flexible. Because of this, it is important that you seek treatment at the earliest sign of a developing hammertoe in order to ensure the best outcome. Since hammertoe is a progressive condition that gets worse over time, the earlier you seek treatment, the better. What are the nonsurgical treatments for hammertoe? At NY-based foot and ankle center, Extend Orthopedics, Stuart Katchis, M.D. has successfully treated many patients suffering from painful and embarrassing hammertoes without the need for surgery. Here are four conservative treatment options that have shown successful outcomes for early stage cases. Physical therapy – Stretching and strengthening exercises can be a great first line of defense to help reverse the muscle imbalance that causes a hammertoe. Footwear modifications – Any shoes that force one or more toes into a bent position must be avoided. This includes tight, narrow shoes and most high heels. Instead, shoes with roomy toe boxes that comfortably fit all 5 toes without overcrowding should be worn. Use of orthotics – In addition to stretching and strengthening exercises, orthotic devices can be useful for counteracting muscle imbalances (and preventing future ones from occurring) by repositioning the foot and toes while wearing shoes. Splinting – Applying splints or tape to the affected toe can help realign it and prevent further bending. What if conservative treatments don’t work? In some cases, nonsurgical treatments may not work – especially for more severe cases of hammertoe where the affected toe is no longer flexible. If symptoms do not improve after pursuing conservative treatment options, Dr. Katchis may recommend a surgical treatment. Fortunately, our practice offers a cutting edge hammertoe correction procedure called Nextradesis, which uses a proprietary implant device that allows patients to bear weight on the affected foot immediately after surgery. It also results in a much faster recovery for patients than traditional hammertoe surgery and it minimizes any chance of recurrence. If you are seeking treatment for a hammertoe in the NYC area, schedule a consultation at Extend Orthopedics today. We offer two convenient locations in Manhattan and Westchester County. Call our office at (212) 434-4920 or fill out the form on this page to get started. Remember: the earlier you get treated, the more likely that you can effectively eliminate your symptoms without surgery!